WOLVERHAMPTON prevailed in a dramatic last heat decider to bounce back to winning ways with a 47-46 win over Poole at Monmore Green. 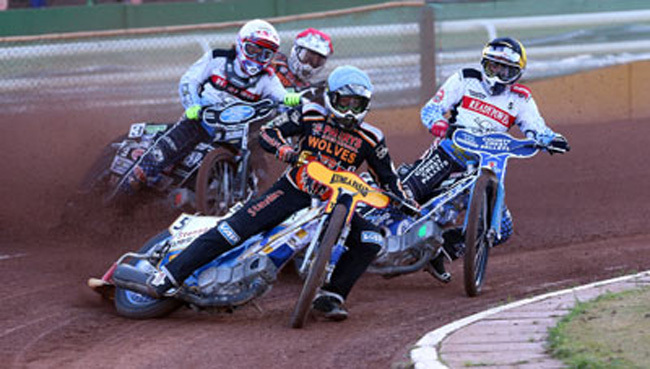 The Parrys International Wolves came back from 12 points down after nine races to stage a quite remarkable comeback and end their tough run of six consecutive defeats. Freddie Lindgren and Ricky Wells joined forces for a big 8-1 in heat 10 as Lindgren took a tactical ride to kick-start their fightback before battling to a 3-3 in the final race to secure three points and lift their side off the foot of the Elite League table. It was a gutsy all-around effort from Wolves on a night of scintillating action – and co-promoter Chris Van Straaten was delighted to see them emerge with a much-needed victory for their efforts. Van Straaten said: “I think even if we’d have lost in that final race, to come from 12 points down and take it to heat 15 was quite an amazing performance. “I went from being so desolate at half past five with the rain coming down to enjoying a wonderful evening of racing. “The entertainment served up was breathtaking, and the fighting spirit shown by our riders going in as underdogs was superb. Whilst Lindgren enjoyed a welcome return to form and Wells impressed in the tough heat-leader position, it was a strong all-around team showing from Peter Adams’ side. Polish hotshot Tobiasz Musielak was in the thick of the action throughout, starting his night with a classy race win before partnering Wells to a vital maximum in the penultimate heat to give Wolves a slender lead. Skipper Peter Karlsson struggled early on but dived sensationally underneath Maciej Janowski in a blockbuster heat 13, whilst Jacob Thorssell added six points despite an awkward fall whilst chasing Poole duo Kacper Gomolski and Dakota North in heat nine. Despite being weakened by the absence of regular reserve duo Lewis Blackbird and Josh Bates due to injury and illness respectively, Adam Roynon pulled off a deserved win in the second reserves race whilst Max Clegg was in the thick of the action throughout despite failing to score. It was a superb night all-around for Wolves to end their losing run, and they will hope to carry their momentum through to the return fixture against Poole at Wimborne Road on Wednesday (7.30). They will be back in action at Monmore Green next Monday (7.30) as they host play-off chasing Swindon. WOLVERHAMPTON 47: Freddie Lindgren 13+1, Ricky Wells 11+1, Tobiasz Musielak 6+1, Jacob Thorssell 6, Adam Roynon 6, Peter Karlsson 5+2, Max Clegg 0. POOLE 46: Maciej Janowski 12, Davey Watt 9, Paul Starke 7+2, Kyle Newman 7+1, Kacper Gomolski 4+1, Dakota North 4, Chris Holder 3+1.